CARE has worked since 1954 in Haiti, a country that is particularly prone to natural and man-made disasters. Its long history of political turmoil, under-investment in social services and lack of urban planning has resulted in extreme poverty, high urban migration and densely populated slums – factors which combined together to make the 2010 earthquake so devastating. 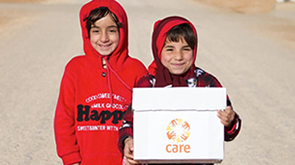 CARE is supporting long-term recovery following the earthquake by building local capacity so communities can organise themselves to participate in reconstruction and to tackle social exclusion, lack of economic opportunities and lack of access to quality education.